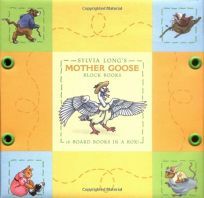 Chronicle continues its line of successful Block Books with a set based on Sylvia Long's Mother Goose. Sylvia Long's Mother Goose Block Books contains 16 chunky board books just right for small hands to stack, knock down and read repeatedly, all packaged in an attractive box with a gift card attached to a carrying cord. Each book presents a different rhyme illustrated in Long's signature style.